There were plenty of curiosities to see art the Frankfurt Motor Show this year. City cars converted into beach buggies. Electric supercars. Exotics with trick folding roofs. Even a tuner Porsche crossover posing as a new vehicle. But few were as intriguing as what we found in one of the back halls of the Frankfurt Messe. 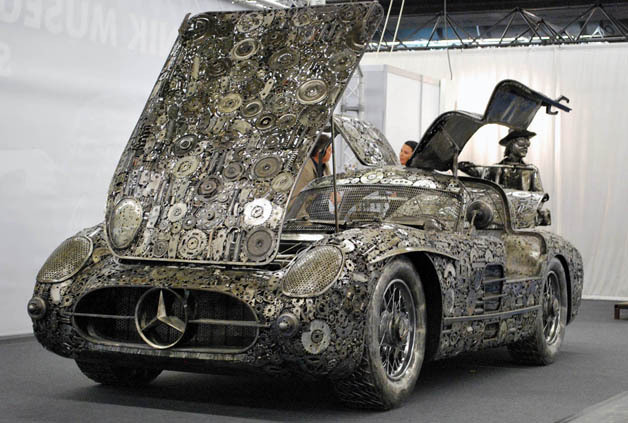 What you see here is a pile of scrap metal transformed by artistic vision into a full-scale replica of the iconicMercedes-Benz 300SL "Gullwing." It's made entirely of reclaimed car parts and random pieces of scrap by German firm Giganten Aus Stahl, which roughly translates as Giants of Steel. It's just one of a number of creations the studio offers to those with enough, um, "scrap" to buy the unique creations. Other projects have varied to include full-scale replicas of famous movie characters – from Peter Fonda in fullEasy Rider glory to Aliens and Predators – as well as animals, athletes, even pieces of furniture. Of course we were most interested in the cars, and in addition to the Gullwing we found similar replicas of a classicPorsche Spyder and pre-war Auto Union grand prix racer. You can check 'em out in our trio of high-resolution image galleries, but if you like what you see, don't expect them to come cheap: the Gullwing fetches a princely €69,000 ($96k), while the Porsche and Auto Union are available for €39,000 ($54k) and €54,000 ($75k), respectively. Head over to Classic-Sportwagen.de andGiganten-Aus-Stahl.de for more information.